We are what we eat and also WHAT WE READ! Now that I’ve eaten my “Broccoli-Dog,” we are what we eat and also WHAT WE READ! 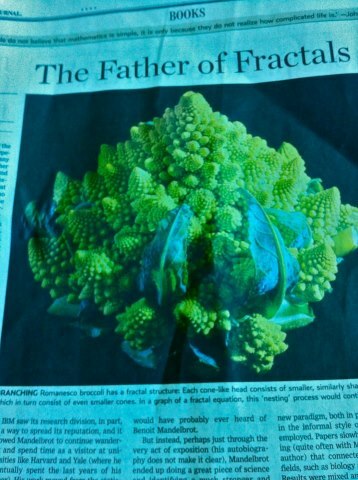 Today’s WSJournal has an article on “FRACTALS” and especially this pictured Romanesco broccoli for each head is repeated by smaller repetitions called “nesting.” NO WONDER OUR INNER AND OUTER LIFE ARE MIRRORS. Measure your inner life by your outer life and your outer life by your inner life.